Officials have identified the three men killed after a UPS driver opened fire during a meeting at company warehouse in San Francisco. San Francisco’s chief medical examiner identified the victims as 50-year-old Benson Louie and 56-year-old Wayne Chan, both of San Francisco; and 46-year-old Michael Lefiti, of Hercules. Police say the three UPS drivers were killed by 38-year-old Jimmy Lam, who fatally shot himself in the head in front of officers. A motive in the killings has not been determined. A union official says the gunman who shot and killed three people at a UPS warehouse in San Francisco had filed a grievance complaining that he was working excessive overtime. Joseph Cilia, an official with a local Teamsters Union, says Jimmy Lam’s grievance filed in March requested that UPS relieve him of working overtime going forward. Still, Cilia says Lam wasn’t angry, and he could not understand why he would open fire on his colleagues at a morning meeting on Wednesday. Cilia says Lam targeted three fellow UPS drivers. Cilia says two other drivers who were wounded have been released from the hospital and will be OK.
Police say the gunman killed himself after the shooting. A San Francisco police department official has identified the gunman who opened fire at a UPS warehouse in the city as Jimmy Lam. The official spoke on condition of anonymity because the investigation into the shooting is ongoing. The official said Lam is from San Francisco, but had no immediate details on his background. The official noted the name is a common one in the San Francisco Bay Area, so finding information about the correct Jimmy Lam required significant record searches. Police say the gunman shot and killed three people and wounded two others before taking his own life. Family members have identified one of the victims of a shooting at a San Francisco UPS warehouse as 46-year-old Mike Lefiti, a UPS driver. Lefiti’s cousin, Bob Toia, told the San Francisco Chronicle that Lefiti was devoted to his wife, family and kids. Isaiah Miggins, a co-worker of Lefiti’s at UPS, said Lefiti was a big man, but humble and always happy. By late afternoon, friends had set up a memorial to Lefiti with flowers and balloons at a local supermarket near the UPS warehouse. Police say a gunman opened fire at the UPS facility Wednesday morning, killing three people and wounding two others before taking his own life. San Francisco authorities say they’re interviewing the families of victims and witnesses to piece together what led a gunman to open fire in a UPS warehouse. He says officers didn’t fire at the gunman, but that he shot himself when they confronted him. Chaplin says authorities won’t release the names of the three who were killed and the gunman who took his own life until the medical examiner confirms their identities and families are notified. He says police won’t know more information about weapon until they test-fire it. A San Francisco woman said she was riding a bus to work when she saw a group of workers streaming out of a UPS facility where an employee opened fire. Jessica Franklin said the workers started banging on the bus when it made a stop Wednesday. She said they ducked as they boarded and told the driver to “go, go, go.” And the driver did. Franklin says the workers were screaming and crying and others were calling family members to tell them they were safe. She described the scene as chaotic. The bus driver then stopped to let the workers out. Authorities and UPS officials say the shooter killed three co-workers and wounded two others. He then fatally shot himself when police approached. A UPS driver said a gunman opened fire as drivers and managers were assembling for a morning meeting in San Francisco and that he saw a co-worker get shot. Marvin Calderon told San Francisco Bay Area news station KNTV that he heard five to six gunshots and that he recognized the gunman as a fellow employee, but he did not know him personally. Calderon said he saw someone get shot in the head and he said he believed all the victims were drivers. He said he ran away as fast as he could. 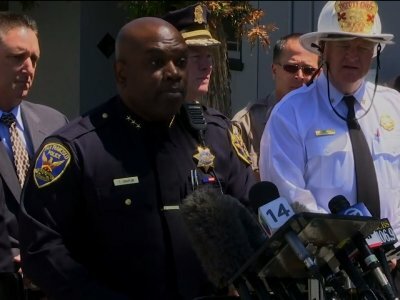 San Francisco Assistant Police Chief Toney Chaplin said four people are dead, including the gunman, who shot himself when confronted by police. Authorities say the shooter who opened fire at a San Francisco UPS warehouse was armed with an assault pistol when police found him. San Francisco Assistant Police Chief Toney Chaplin told reporters that officers found wounded victims and brought them to safety Wednesday. When they found the gunman, he put the weapon to his head and shot himself. Three people were killed as well as the shooter. Two others were wounded. Authorities say a shooting at a San Francisco UPS warehouse has killed three people as well as the shooter. San Francisco Assistant Police Chief Toney Chaplin says at a news conference that two others were wounded Wednesday. He says that the shooter shot himself, and police have not determined a motive. This item has been corrected to show that Toney Chaplin is San Francisco assistant police chief. The building is located in Potrero Hill, which is about 2.5 miles from downtown San Francisco.